Believe it or not, I have never made a flying geese quilt before. It's always been on my list. Several months ago the kind people at Timeless Treasures sent me some fabric to play with. I requested a bundle of Matilda by Alice Kennedy. With the busy summer, it took me a while to finally dig in. When fall rolled around, I decided it was time to work with this bundle. 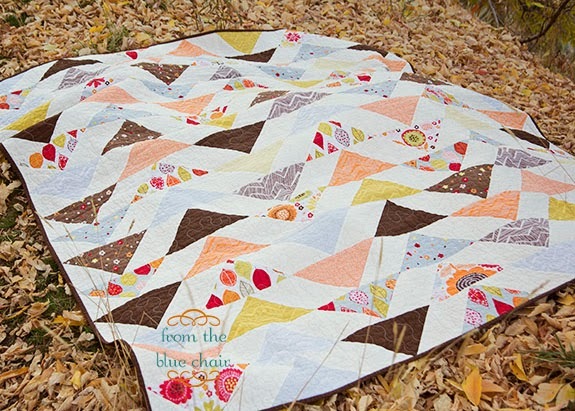 I love the big prints from the line, but large prints don't generally fit into my quilting style. I decided to finally take the leap and make a flying geese quilt, but make the geese large enough to showcase the prints. I backed the quilt in minky which really has become my favorite quilt backing. The binding is Timeless Treasures Sketch in Coffee. I did a simple all-over stipple using cream thread. My geese were cut using the EZ Quilting Easy Star and Geese Ruler which I believe I purchased about three years ago. It was so long ago that I forgot I even had the ruler and almost bought it again. Luckily I checked my ruler stash before checking out. The geese are 4 1/2" x 9" finished which ended up being the size to best use my fat quarters. The quilt finishes about 60" x 72". It will be wrapped and gifted this Christmas to someone special. One gift checked off the list! 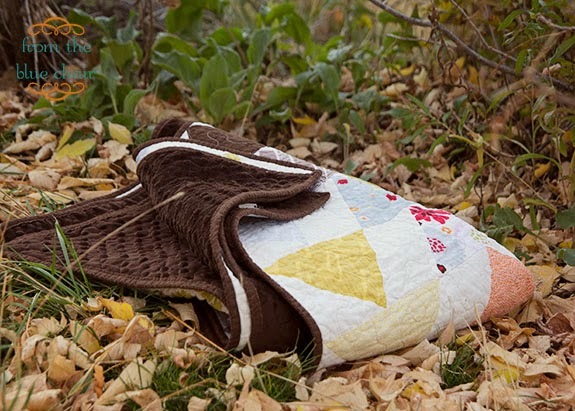 And since I was taking these quilt pictures in the leaves, here are a few other pics from my little photo shoot. 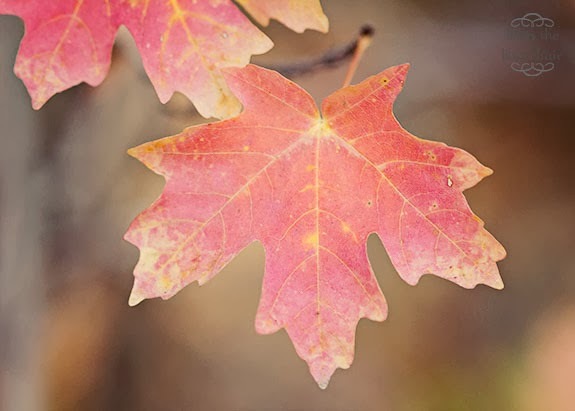 Fall is my favorite time of year for photos. This is really beautiful. 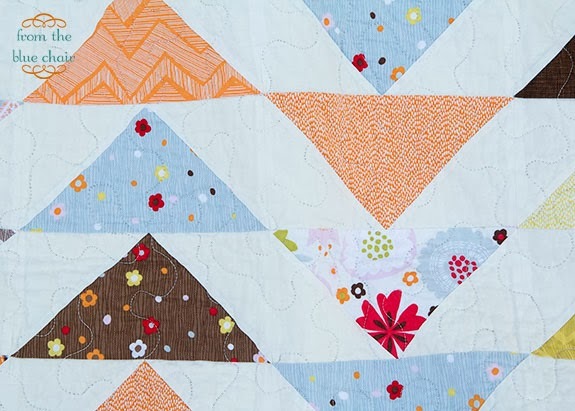 Do you use a batting when you back your quilts with minky? I know some people do and other don't. Wow, I am not sure which I love more, your quilt or your photography, both are so beautiful! Wonderful! 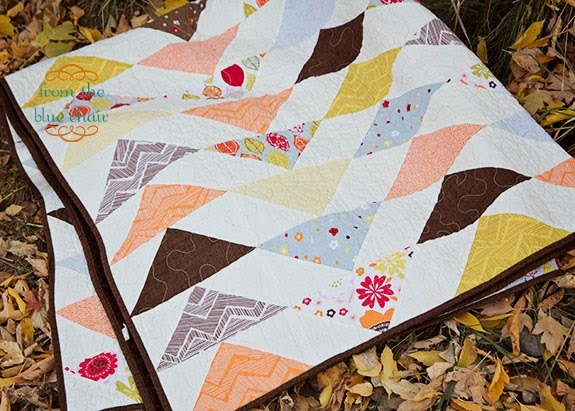 I adore flying geese and your quilt turned out so well! I keep thinking I'd like to make a quilt like this with Christmassy prints. Maybe next year! Beautiful! I love using minky as backing, too! Gorgeous! Both the quilt and the view! 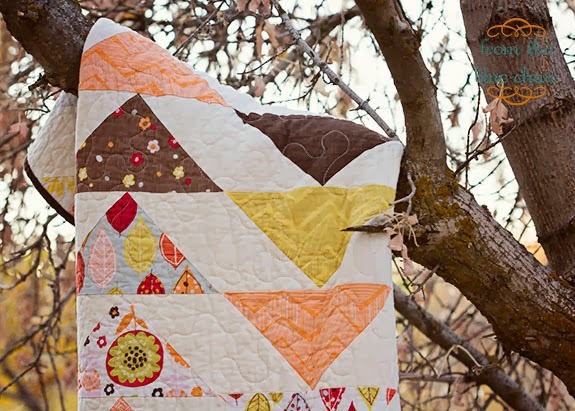 What a beautiful quilt and great idea for larger prints! When you use minky on the back, do you still put batting in the middle? Just curious since I've never worked with minky and I really like the feel of it and the texture it gives. Lovely quilt and the brown backing it perfect. Minky is my daughters favorite too. We are planning a oversized throw for her college home next year and this may be the ticket. Thank you for the beautiful photos. Also I do use batting when using minky but I also take it to a very experienced long armer who works wonders. What a wonderful quilt. The lucky recipient of your gift will be pleased! I love this!!! 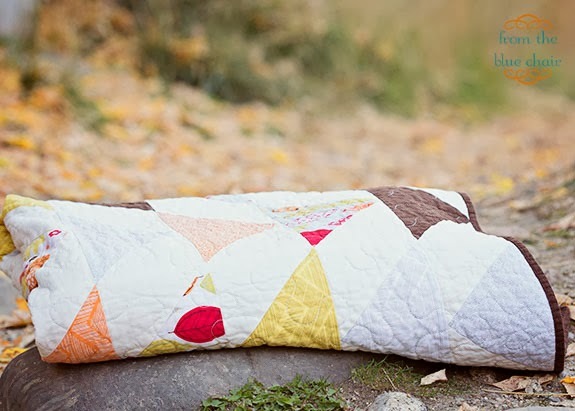 I haven't done a geese quilt yet either, but it's on my list to do...especially after seeing yours!! Can I be on your Christmas list...I really, really like the quilt! I am not sure if I like small flying geese or not, but I love your large flying geese. I have some large scale fabric that I love but not sure what to do with it. Now I have a fabulous idea. Thanks for sharing. I haven't tangoed with flying geese yet either! But boy do I love your debut! You don't often see these colours but I love them. Oh man, your quilt is gorgeous! I really love everything about it and it is perfect for fall. 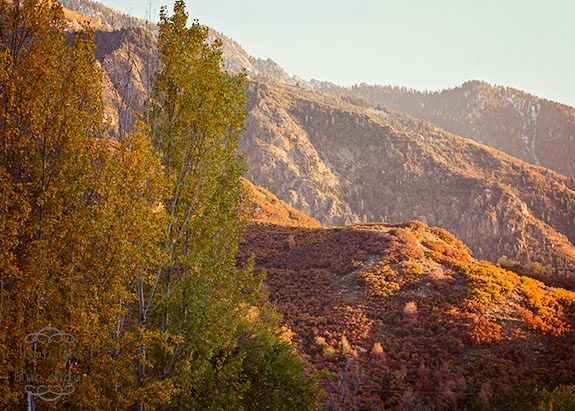 What beautiful fall pictures also.